Viktor Troicki of Serbia returns a shot to Andy Roddick during thier quarterfinal match at the Legg Mason Tennis Classic at the William H.G. FitzGerald Tennis Center on August 15, 2008 in Washington, DC. WASHINGTON (AP)—Andy Roddick’s tournament is over, but Juan Martin del Potro’s streak continues. Roddick was upset by Viktor Troicki 0-6, 6-2, 6-4, in the quarterfinals of the Legg Mason Tennis Classic on Friday, the same day second-seeded del Potro won his 17th straight match, a 6-4, 6-4 victory over John Isner. The second-seeded del Potro, who has won the last three tournaments he’s played in, will face fourth-seeded Tommy Haas, a 7-5, 6-1 winner over Alejandro Falla. The other player in the semifinals is Igor Kunitsyn, who beat qualifier Somdev Devvarman 6-4, 6-1. Roddick dominated Troicki in the first set, but ran into trouble after he was broken in the second set. The match was interrupted by a 57-minute rain delay with Roddick up 1-0 in the third set, and Roddick’s serving problems were the turning point. Holding serve at 3-3, Roddick double-faulted twice—including one to give Troicki the advantage a point before Roddick hit a ball long to lose the break. “That was the best moment for me in the match,” Troicki said. Roddick needed to save match-point twice in a two-hour, 43-minute win against Eduardo Schwank on Thursday night. Against Troicki, he was unable to pull out another comeback. 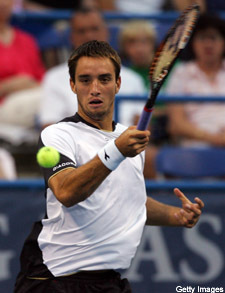 Troicki had two aces in the final game to cap the win. Del Potro has made almost no mistakes in the last month and a half. His last loss came in the second round of Wimbledon on June 25. The 19-year-old Argentine has risen to No. 19 in the world rankings. “He’s playing like he’s top-10, as hot as he is,” Isner said. Isner was trying for his first semifinal berth since he made the finals here last year, when he was the runner-up to Roddick. Del Potro did not face a break point in the match and converted both of his opportunities to break Isner’s serve. In the first set, del Potro came back from a 30-0 deficit to break Isner and go up 5-4. He tallied two of his six aces in the next game to take the first set. After a 27-minute rain delay in the second set, del Potro broke Isner for a 4-3 lead and then held serve for the victory. At 6-foot-9, Isner often relies on a big serve, but the 6-6 del Potro mostly neutralized Isner’s power. Isner had 29 aces in his first two matches, but only seven against del Potro. Haas fell behind 4-1 in the first set, but came back to pull out the opening set and cruise in the second. The match between del Potro and Haas will be the first meeting of seeded players in this tournament, which saw five of the eight seeds upset in the first round. Haas and del Potro have never met. Del Potro is dealing with fatigue after playing a string of matches. He beat Roddick for the Countrywide Classic title in Los Angeles on Sunday, and played his opening-round match here Tuesday. “My head is tired, but I want to win more matches,” he said.